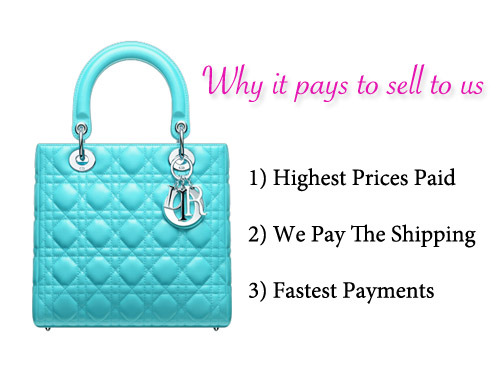 Why Sell Your Bags to SellHandbags.com? We make selling your handbags simple. Whether you are buying a new handbag, selling it because of a financial reason, or just sick of your current handbag or accessories we at SellHandbags.com are committed to gaining your trust. We have an excellent reputation because we offer realistic pricing and convenient options for sellers and buyers of authentic luxury items. Make an account and upload your handbags individually with pictures in your dashboard screen. We will notify you when an offer is made and send a buyout price within 24 hours. Our price quotes are based on the handbag brand, condition and authenticity. Print out our letter with your free shipping and insurance label and mail it into us. Payments are processed within 1 day of receiving the item after we authenticate it. Convenience. Our system is geared to be convenient, fast and practical for any user, we make selling luxury handbags safe, easy and secure with our secure online system. Trust. Be rest assured you are getting the highest cash value for your handbag, we are competitive and estimate roughly 50-70% of the bags online resale price. Reputation. With a name like SellHandbags.com, how can you not trust us? Even for the skeptical we offer higher prices for luxury items that are authentic because we can and who we are and know, with that said, that makes us able to sell items quickly and put it back into our business to offer you more great deals on luxury items.